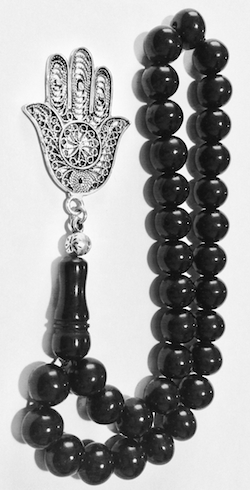 Total closed length: 8.66 inch / 22 cm, bead diameter: 9 mm; sterling silver hamsa group length: 1.77 inch / 4.5 cm. Brand new. Lightweight, well balanced, easy to drag and to carry. 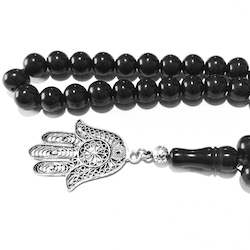 Oltu stone or Erzeroum stone, also known as black amber is one of the most appreciated gemstones of Turkish folk art and tasbih making. It is mostly preferred for its extreme brightness and its low weight. The term "black amber" is valid and academically accepted, as used in the article Patterns of Black Amber Bead Making in Northeast Anatolia, Ethnoarchaeological Investigations in Rural Anatolia, Vol. I, Istanbul : Ege Yay., 2004; pp. 115-126. Oltu stone is known to be formed within geological layers under pressure and is a mixture of resins and lignites. Its exploitation is not industrialised, the peasants work with very primitive tools within very primitive mining galleries underground. Oltu stone’s properties can be summarized as follows: 1) Soft when first exploited, becomes harder as it is carved by contacting with the air. 2) It gets glossy as long as it is used. 3) Usually black, exceptionally brown. 4) It burns when contacted with a flame 5) Heavier than plastic, lighter than glass 6) On a sandpaper it draws a brown line, polyesther or plastic draws a white line. Not cast powder, not exotic plastic, a noble material, a rare gemstone used by Turkish people for prayer beads and in folk art jewelry since may centuries... The Oltu strand used in these beads stands out with its perfect uniformity in shape and color and as such it brings to you the refined taste of the Ottoman classics.